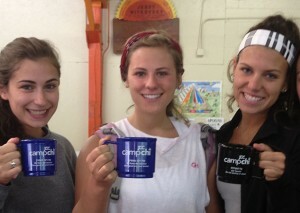 JCC Camp Chi decided to address their use of disposable dishware during outdoor meals. In a typical week at JCC Camp Chi, three to five meals, including all Saturday Shabbat meals, were eaten outside using disposable paper and plastic products. In addition, they used disposable cups for coffee and hot drinks served daily in the dining hall. JCC Camp Chi is a large camp, and the environmental impact of this non-recyclable waste was significant. Their supply of reusable dishes, cups, and silverware was not large enough for outdoor use when the entire camp ate at the same time instead of eating in shifts like they do in the dining hall.In recent years, JCC Camp Chi, located in Wisconsin, has taken a number of steps to reduce consumption and decrease their waste. For example, they now use online registration, bulk purchasing, reusable prayer cards, and they have increased their recycling. The camp was looking for more ways to reduce their waste and to have a project that would form the basis for Jewish environmental programming with campers. The investment in reusable tableware at camp, changing their approach to eating outdoors, and educating the campers about the environment and Jewish values is a lasting change, which will reduce their environmental footprint for the upcoming summer and the future. JCC Camp Chi also sees the potential of the successful implementation of this project serving as a model for their food service provider, which serves camps across the country, as well as other JCC overnight and day camps. One of the things that JCC Camp Chi did in preparation for this project was to purchase a new dishwasher. Their new dishwasher is significantly more efficient than their previous one and can handle the increased load of dishes. They took the advice of their kitchen equipment supply company about what to buy considering the space that they had available. Through the Gendler Grapevine Project grant, JCC Camp Chi invested $4,555 in reusable table settings, which included 800 plates, 600 cups, 325 mugs, 300 bowls, 600 forks, 300 knives, and 300 spoons. They also took advantage of the opportunity and had the mugs imprinted with their name and quotes about the environment from Jewish and secular sources. This one time investment in table settings will reduce or completely eliminate using disposable products when serving dairy and meat meals in the area outside of the dining hall. In addition, the project will have an impact on JCC Camp Chi’s annual budget, as the project will eliminate a large portion of the budget currently spent on disposable products and will allow Camp Chi to put that money toward programmatic efforts, scholarship support to families, or other items that support the mission and vision of camp. It also has the side benefit of reducing their overall waste and hence their garbage collection fees. Organizers from JCC Camp Chi offered suggestions for other camps looking to emulate this project. They said that they worked with their food service provider to come up with a system for collecting dishes outside and bringing them back inside for washing. They employed a similar system for sorting dirty dishes, cups, and silverware to what they use inside. They also have to adjust their kitchen staffing, particularly on Saturdays. They recognized that they would need additional support staff to help with the dishes. In the past, many more of the staff had a day off on Saturday. It should also be noted that JCC Camp Chi is a larger camp, with over 1100 campers over the course of the summer and an average weekly camp population of over 800 campers and staff. The number of dishes they ordered was for a large community. Please consult your kitchen equipment supply company when figuring how many dishes and silverware you need.